﻿ Welcome To Picture Viewer Pro.Com! Latest Version: Picture Viewer Pro v2.0 - Build 229! A few years in the making... Picture Viewer Pro was built for a purpose to do a specific job and to do it well.. It is fast, small, light on resources and has no bloatware features in it, unlike some of its competitors products! If you don't have the time, click here for the download page. Windows 7 Compatible! Picture Viewer Pro Selected As Editor's Pick By FiberDownload! It was awarded 5 stars. You can view their entry here. Additionally, we have added a preferred partners page to our website here that you may like to check out. Picture Viewer Pro 2010 Update! A few people have been asking this question, so here is the answer..
Is Picture Viewer Pro compatible with Windows 7 (32 or 64 bit versions)? Answer: Yes! It will run happily on ANY version of Windows 7. Now that Windows 7 is final and released, we did further testing and all is well! There will be an update to Version 2.0 soon that will fix a few minor bugs (nothing to do with Windows 7) and add native Windows 7 detection inside the program itself - even so.. the current release runs fine anyway! Work is continuing on Version 3.0 - expect a public beta soon. Anyone who is running Version 2.0 and has registered their copy can email us to request a private beta version and a new key for Version 3.0 at the moment - if they so wish! Picture Viewer Pro Reviewed By DownloadTube! Downloadtube.com editor team would also like to congratulate the high quality standards achieved by your software in front of it's competitors. 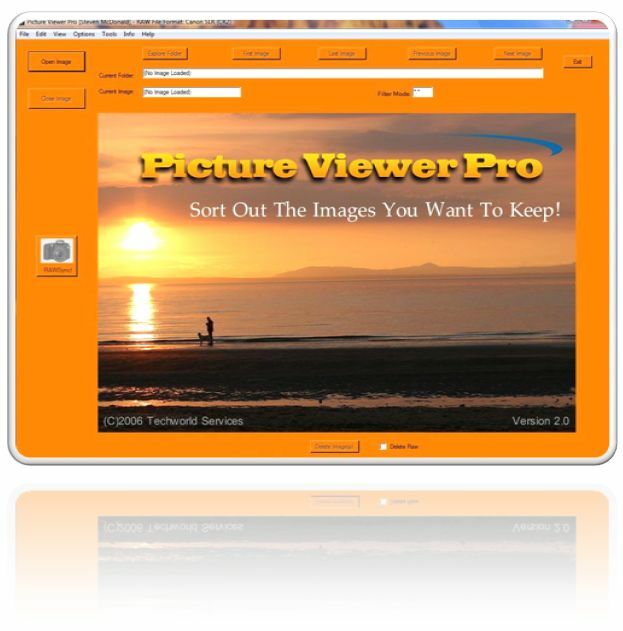 "Picture Viewer Pro is a small, simple, fast and accurate picture viewer with some really nice and helpful extra features." More information about Picture Viewer Pro's certification and the certification award is available on this page. 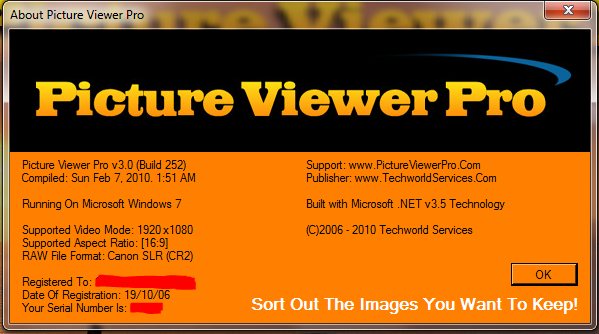 Picture Viewer Pro was last submitted to Softpedia labs way back in October, 2006. "This product was last tested in the Softpedia Labs on 09 September 2008 by Irina Hutanu. Softpedia guarantees that Picture Viewer Pro 2.0 Build 229 is 100% Clean, which means it does not contain any form of malware, including but not limited to: spyware, viruses, trojans and backdoors. This software product was tested thoroughly and was found absolutely clean; therefore, it can be installed with no concern by any computer user. However, it should be noted that this product will be retested periodically and the award may be withdrawn, so you should check back occasionally and pay attention to the date of testing shown." Click here to view the certificate on SOFTPEDIA's own website. Final Build 229 is now available! Mainly a bugfix release, we urge everyone to upgrade to this version. Free to all registered owners. Again, License Keys issued for Build 215 still remain valid! As before, you can upgrade now by visiting the download page here. The changelog for those interested is here. Work is continuing on Version 3.0 internally, and a feature list will be posted soon. Build 228 is now available! We urge everyone to upgrade to this new version as some new minor features as well as bug-fixes to the trial version are included. Added support for identifying and reporting on [1:1], [1:2], [2:1] and [1.66:1] format images. Added support for Exif 'Description' and 'Edited with' information. (All modes). A bug introduced in build 222 that meant certain buttons on the main form didn't operate in trial mode has been fixed. You can also download a full ISO CD Installer version, complete with all required support files. Additionally, the test image pack has been updated and can be downloaded here. Version 3.0 will require new keys which will be mailed free to every registered user when the time comes. Internally, work is progressing well on Builds 237 and upwards! Build 227 has proven to be very stable and reliable. There will be one more maintenance release of version 2.0 of Picture Viewer Pro. This will actually be a back port... Internally, work is progressing on the next major version - free to all registered users of course! More details soon on all this. Build 227 is now available! We urge everyone to update to this latest version as it is the most stable yet. All known bugs are now fixed, speed slightly optimised, memory footprint reduced, new automatic downloading of future updates to your desktop etc. Note: The program does not contact this website without your permission - you need to manually click on the Help Menu - Check for Updates for this to occur! Just to clear that point up! For trial users, the start up nag screen delay has now been reduced! Build 223 is now available! Yes, two builds in less than 24 hours! This is the new preferred release - the program now has a built in feature on the help menu to query this server for new versions. If so, it will offer to take you to the downloads page. Build 222 is now available! As promised, a new version is now available - free to all registered owners. License Keys issued for Build 215 still remain valid! You can upgrade now by visiting the download page here. The changelog for those interested is here. Whist there are no major new features, many bugs and problems with Build 215 have been corrected and it is advised that everyone upgrades to this new version for now. It has been 15 long months since the last release.. From now on, updates will appear much more frequently! In addition, all pages on this website have been updated and spruced up! After a lengthy break, work has again started on a new updated version. There were some technical problems with the source code archive, which have now been fully rectified! Many thanks to all who have purchased the program so far and also everyone for their feedback. More news will be posted here soon - we expect to have a free updated version soon. Picture Viewer Pro Certified 100% Clean Award! Picture Viewer Pro has been assessed and added to the popular www.softpedia.com software library. In addition, it has been independently certified as spyware, adware, trojan and virus free! Full Details below. "Picture Viewer Pro 2.0.0.215" has been tested by the Softpedia labs and found to be completely clean of adware/spyware components. To assure our visitors that "Picture Viewer Pro 2.0.0.215" is clean, we have granted it with the "100% CLEAN" Softpedia award. Full ISO Image Now Available! You can now download a full ISO CD Installer version, complete with all required support files. The purchasing page and the rest of the website content are now live! Note the special launch promotion above! To celebrate the launch of this program, 20 lifetime licenses will be given away free of charge! 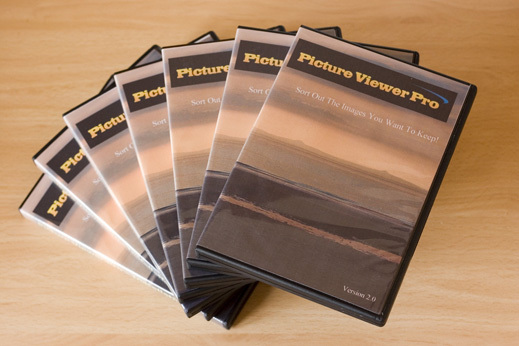 To get one, all you have to do is email your full name to support@pictureviewerpro.com and make sure you tell as many people as possible about this site. Thank you! The first 20 respondents will be sent a free license! There are many things being worked on but an initial website presence is now online! Why Use Picture Viewer Pro? Picture Viewer Pro is small and loads fast and enables you to get a fullscreen aspect ratio correct view of your pictures on the screen. You can then use the mouse to easily navigate through your pictures. With a mouse click or easy to remember keypress, photographers can view all sorts of technical shooting information. You can use it to delete unwanted files, synchronise your RAW files, view a slideshow or process your files to greyscale, or to take up less disk space. You can use the trial version indefinitely or for a small fee, purchase a lifelong valid license, giving access to all the programs features and free updates, as they are released. The program responds to easy to remember keypresses for its major functions, making it easy to learn and use. A free trial version is available now! Picture Viewer Pro is used and recommended by Clarkson Studios in Canada. If you are looking for a great photo viewer then PictureViewerPro is the tool you need. As a photographer, one of the features I like about it is the ease of viewing your photos for the first time and then deleting those that you don't want. Give PictureViewerPro a try, I think you will like it.